View our stunning range of Carnival Cruises deals. Dive into a world of moving experiences and unforgettable memories. Carnival Cruise Line is all about fun vacations at sea. The "World's Most Popular Cruise Line" is renowned for catering to cruisers of all ages, from adults to children and youth aged 2-17. You will feel right at home in Carnival Cruise Line's comfortable staterooms, exceptionally attentive service and superb casual and elegant dining options. A fantastic range of age-appropriate activities, including Carnival Waterworks, the Splash Zone, and Green Thunder provide endless fun for kids, with a great range of exciting nightlife and entertainment options for adults. Carnival Cruise Line operates 26 ships departing from various ports throughout the US including Los Angeles, Vancouver, Seattle, Fort Lauderdale, Miami, Tampa, Jacksonville, New Orleans and Charleston to name a few. Embark on 3- to 16-day cruises onboard the Carnival Vista, Carnival Magic or Carnival Sunshine to some of the world's most breathtaking destinations, including Alaska, Mexico, Cuba, the Bahamas, Hawaii and the Mediterranean. Carnival Cruise Line also offers cruise vacations a little further from home, with Carnival Legend cruising Australia, New Zealand and the South Pacific. With comfortable cabins, family-friendly activities, and a relaxed, come-as-you-are onboard atmosphere, the Carnival Breeze is the perfect ship for a relaxing Caribbean vacation at sea. Enjoy a casual, family-friendly cruise on the Carnival Imagination. Departing from Los Angeles and sailing along the sunny Mexican Riviera, this action-packed ship will guarantee you an unforgettable cruise vacation. One of the largest ships in the Carnival fleet, the Carnival Conquest is sure to live up to Carnival's motto: "Fun for All, All for Fun." There's no shortage of entertainment, activities, and experiences on board this massive cruise ship. Enchantment and adventure for the whole family! The Carnival Magic is a crowd-pleasing cruise ship offering comfortable amenities, fine dining and a range of activities for adults and kids. Set sail for an unforgettable adventure! One of the largest ships in the Carnival fleet, the Carnival Dream is the perfect family ship. Featuring the Serenity Area for adults, the Camp Carnival for kids, and the Club 02 for teens, she provides both entertainment and relaxation for cruisers of all ages and lifestyles. A classic mid-sized cruise ship, the Carnival Fantasy embarks on exciting itineraries to tropical destinations in the Caribbean and to the Panama Canal. Whether you're looking for adventure or relaxation, the Carnival Fantasy will take you there. The Carnival Ecstasy is an outstanding mid-sized ship sailing from Charleston, South Carolina to tropical destinations in the Caribbean. Enjoy an exciting cruise in a casual atmosphere that makes the whole family feel welcome. The Carnival Sensation's impressive facilities will enhance your cruising experience. Splash away at Waterworks, enjoy the Punchliner Comedy Club and relax in the comfort of your stylish stateroom or suite. With an action-packed onboard environment and activities the whole family can enjoy, there's never a dull moment on the Carnival Inspiration. Embarking on short trips from Los Angeles to Mexico, the Carnival Inspiration is great for families, couples, and first-time cruisers. Experience an unforgettable journey with nights full of entertainment and excitement on board the Carnival Paradise. Indulge in fine cuisine and get pampered in the spa. Enjoy endless entertainment, kid-friendly activities and a soothing wellness area on the Carnival Victory. This crowd-pleasing ship is sure to guarantee family fun in a laid-back environment. Hop onboard the Carnival Valor for an epic cruise vacation to the most stunning tropical locations and scenic beaches. Let your stress melt away as you stretch out on a lounge chair in the Caribbean sunshine. The Carnival Liberty sets a new standard of cruising by combining innovative perks with classic comforts. Enjoy a wide selection of activities on board as well as at port for a memorable vacation. Carnival Freedom is the perfect ship for a casual cruise through the Caribbean. Whether it's a decadent adults-only spa retreat, a chance encounter with beloved Dr. Seuss characters, or comfort food in the onboard restaurants, the Carnival Freedom has something for every type of traveler and budget. The Carnival Sunshine was designed with your comfort in mind. With its elegant, minimalist design, its spacious wellness area and spa, and family-friendly entertainment and activities, it's the perfect ship for a relaxing vacation. Experience a mythical vacation on the Carnival Legend. With a dazzling display of onboard amenities, comforts, and activities, there's never a dull moment when you cruise with Carnival. The largest ship in the Carnival fleet offers fantastic facilities to make your cruise vacation an incredible experience, including the SportsSquare, the WaterWorks and the world’s first at-sea IMAX cinema. Launched in 2018, the Carnival Horizon is one of the newest members of the Carnival fleet. With spacious staterooms and state-of-the-art facilities, passengers are guaranteed an unforgettable cruising experience on this one-of-a-kind ship. Scheduled to launch in 2019, the Carnival Panorama will take you on a journey through the majestic Mexican Riviera. Enjoy a huge range of activities onboard, including a massive water park, high-end musical and comedy entertainment, and an extensive casino. The Carnival Sunrise offers a huge variety of stateroom options to suit every budget and travel style. Newly refurbished in bright colors and soothing pastels, the design of the ship is inspired by the tropical regions she visits. 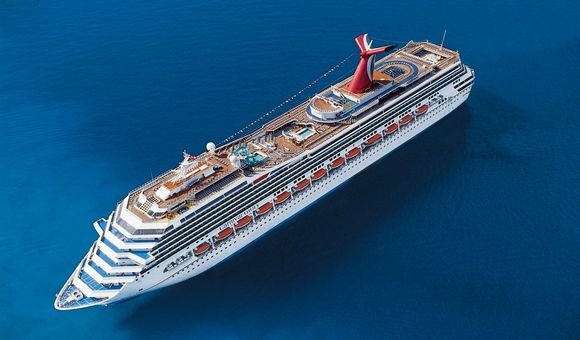 Following a massive refurbishment and upgrade, Carnival Radiance will hit the seas in April 2020 a ship transformed. Guests can look forward to a new adults-only pool area, two new waterslides, and an all-new chicken joint onboard. Carnival Mardi Gras is a non-stop party. Hitting the seas in 2020, she'll introduce New Orleans flair, an Emeril Lagasse restaurant, and the world's first roller coaster at sea. Carnival Cruise Line is the largest cruise line company in the world. Based in Miami, Florida, Carnival Cruise Line is dedicated to ensuring that their guests have the time of their lives from the minute they board. Carnival cruise ships offer an exceptional value at sea – as well as top-quality service, lively entertainment and a wide range of popular destinations, such as the Caribbean, Alaska and the Bahamas. When you cruise with Carnival Cruise Line, you will depart from convenient ports like Miami or Port Canaveral. What are the best activities onboard Carnival Cruise Line ships? Sail away in luxury and sophistication on one of Carnival’s amazing cruise ships and make unforgettable memories with one goal in mind: to have fun. Whether you are a thrill seeker, an adventurer or just a laid-back lounger, there is something for everyone onboard Carnival Cruise Line! Take a Yoga or Tai-Chi classes, try Carnival ropes course or simply jump in the pool for a refreshing swim. Create your own cruise holiday with the activities you love the most – outdoors Seaside Theatre, mini-golf, top-of-the-range sports facilities and much more will keep you occupied for hours! Traveling with kids? There is a great variety of entertainment spots for youth onboard Carnival Cruise Line. Meanwhile, treat yourself to a spa therapy, like hot stone massage or full-body wrap. A cruise company like no other, Carnival prides itself on world-class entertainment and voyages to the most breath-taking destinations on the planet. Carnival Cruises ships are known as the “Fun Ships” what makes cruising the way they should be made. With Carnival Cruise Line, you are guaranteed your cruise vacation of a lifetime onboard magnificent cruise liners with the comfort and quality service of a floating resort! If a legendary cruise is what you desire, then look no further. Carnival Legend lives up to its name and features all the classic Carnival Legend favorites. Each resort-like cruise liner is tailored to a different taste with one common detail: ensuring that every guest on board has the time of their life!